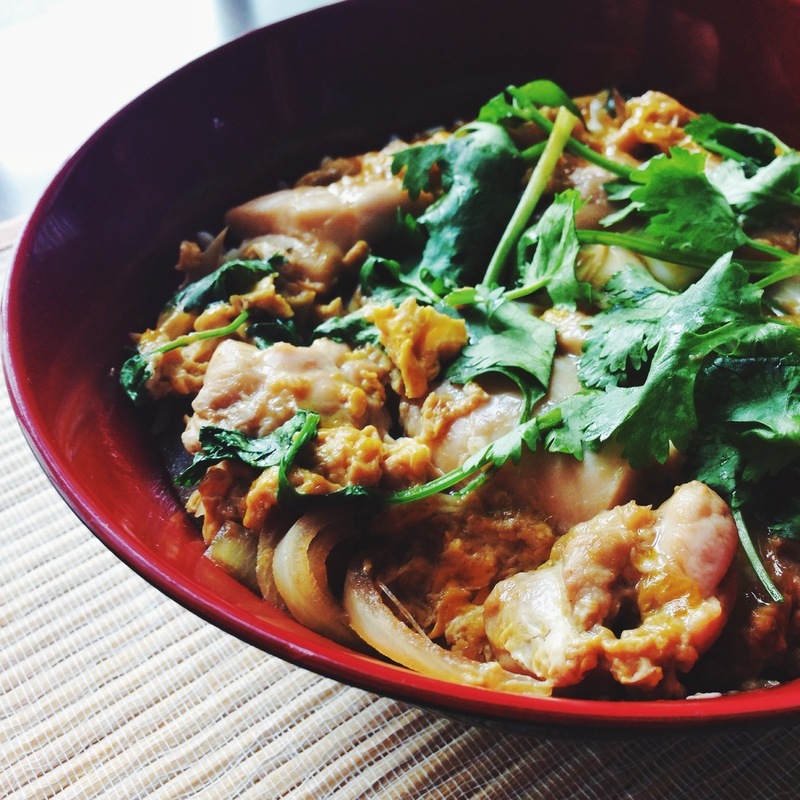 This rustic looking recipe is one of the most common dish in Japanese restaurants. The name of this dish practically means parent-and-child 'don'. Which involve the parent chicken and the child eggs. The main problem I encountered in this dish was that strong unpleasant chicken taste, but after trying a few methods i'm able to get that strong taste off, and achieve a good balance to it. Its cooked in a special pan called oyako nabe, I got it from Daiso, if you don't have it, normal small pan will do. Prep the chicken thigh by cutting it into bite size chunks. Marinate it for 5 to 10 mins with 1 tbs of sake 1/2 tbs of soy sauce, minced garlic and ginger. Cut the onion into 1/2 inch slices. Lightly beat 2 eggs in a small bowl, do not over mix! Seared the chicken on a normal separate pan till nice brown on each side and set aside. Heat your oyako nabe pan (normal small pan) with the stock, mirin, sugar and rest of the sake and soy sauce. Test and adjust the taste accordingly after everything is combined. Add in the onions and cook with the lid on for about 5 mins then add in the seared chicken chunks with lid on and cook until onions turn soft. Adjust heat to low medium simmering. Do not put on high, as the stock will spill as it over boil in the small pan. Now add in half of the beaten eggs, cover with lid for 10-20 secs. Pour in the rest of the eggs. Garnish with parsley, off the heat, cover and let rest for about 10-15 secs. 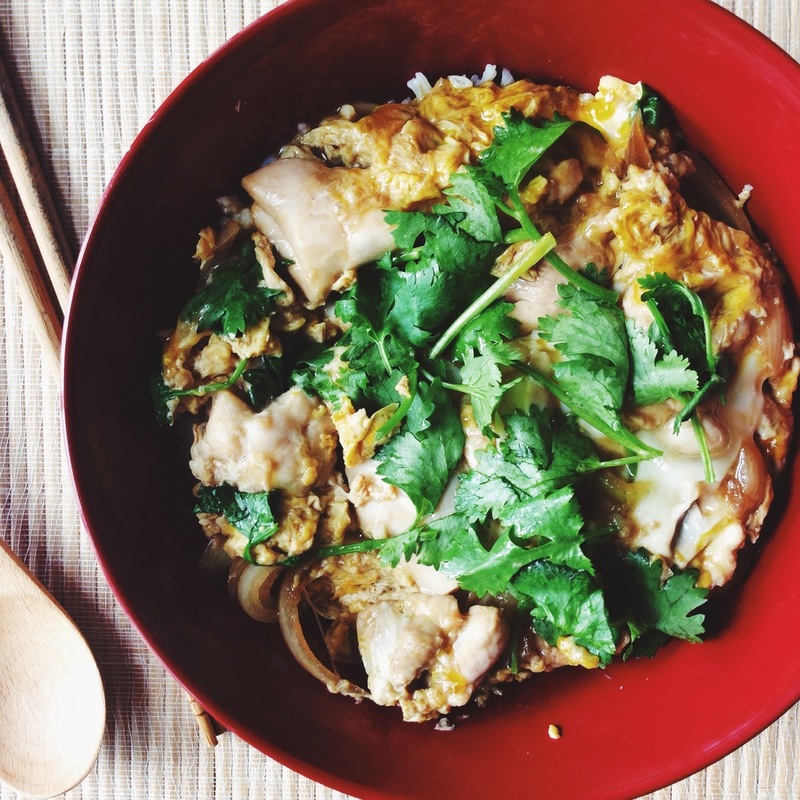 Serve over your rice bowl. DONE! You should be able to achieve a smooth texture from the eggs and tender chicken thighs that balances out well with the sauce. The method in keeping the strong chicken taste in check is by marinating and searing it before you cook with the seasonings. Hope you guys like it! Enjoy!